Having reached the Indian Ocean, the sea picked up a bit. The wheel holding the tow wire is the towing gog, which is used to fix the wire to the midship area. This has several benefits involving stability, manouverability and safety. Also, it helps control the tow wire, and prevents it from jumping around in poor weather. 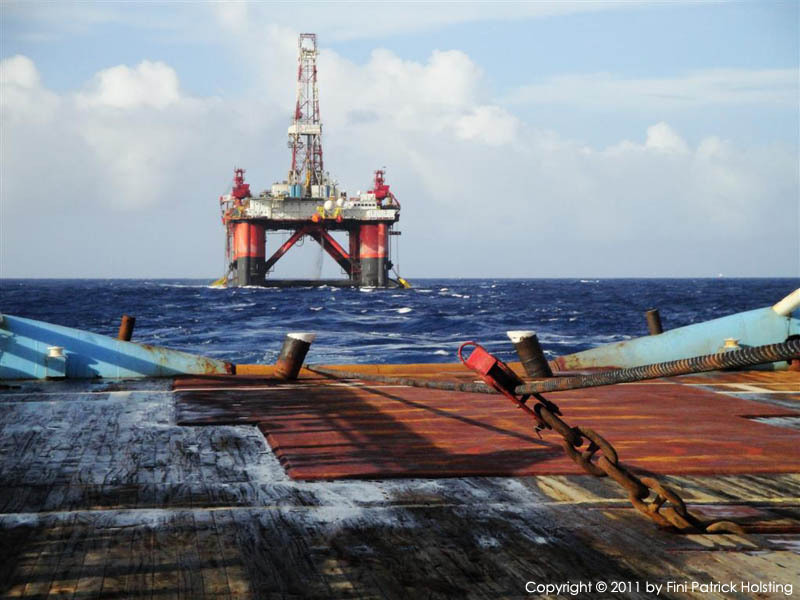 At this particular time the tension in the tow wire was about 120 tonnes, meaning that Maersk Promoter pulled with a force of 120 tonnes in order to move the rig forward. This gave us a speed of 7-8 knots. 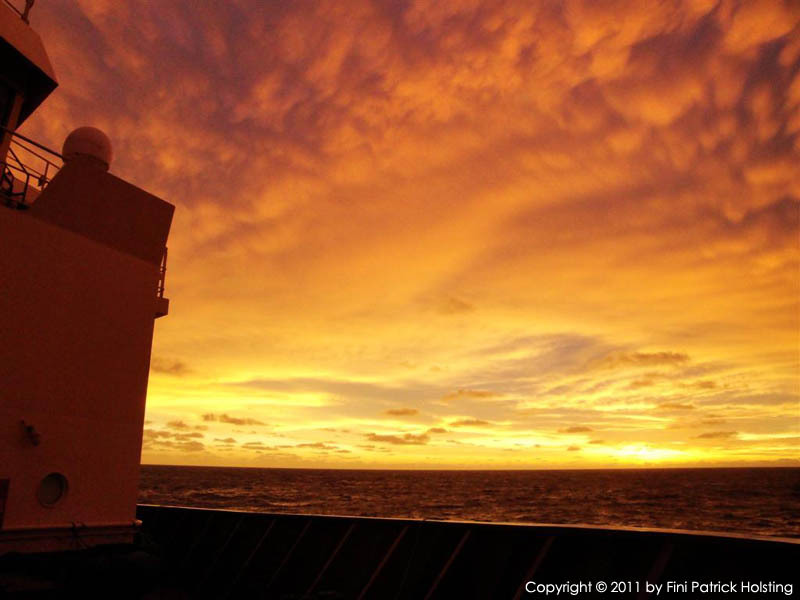 Here we have reached the final destination, the Vincent Field off Exmouth, northwestern Australia. We've taken the speed off the tow, and another anchor handler is approaching the rig in order to pick up one of the anchors and run it out, thus anchoring the rig one anchor at a time. 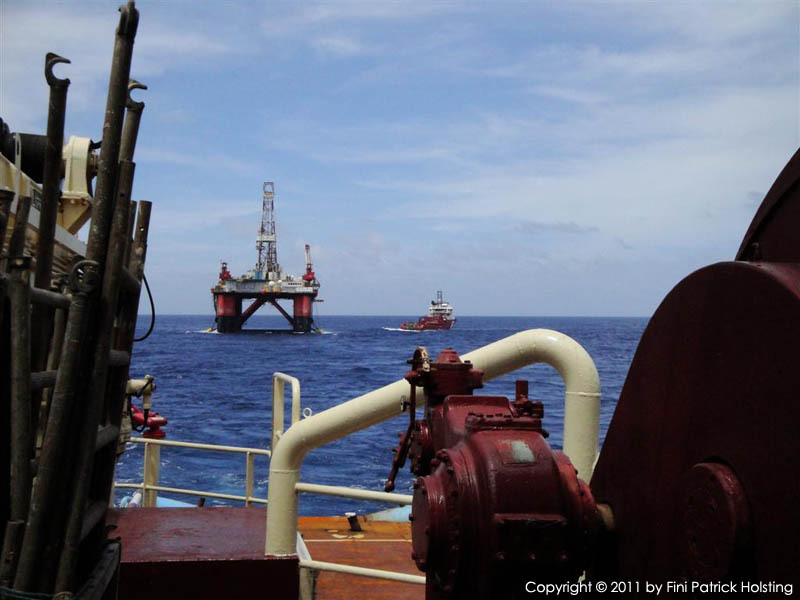 The Nan Hai VI semi-submersible drilling rig successfully anchored offshore on the Vincent Field. We had now been disconnected from the tow bridle, and the rig was staying stationary only by the 8 anchors, layed out in a spread in a full circle around it. We finished just in time as the weather then picked up as a cyclone approached. 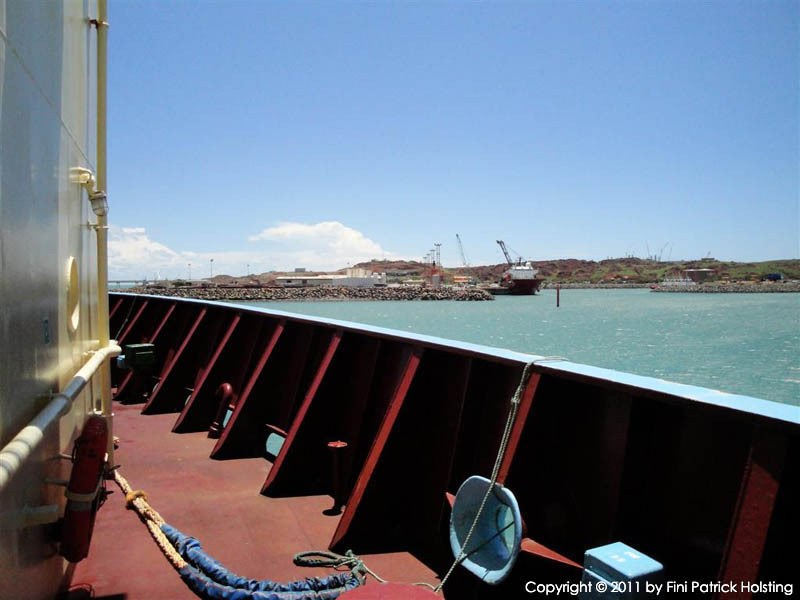 The King Bay Supply Base in Dampier, Australia is a busy offshore port. The Promoter was frequently in picking up cargo for the Nan Hai VI and other jobs. 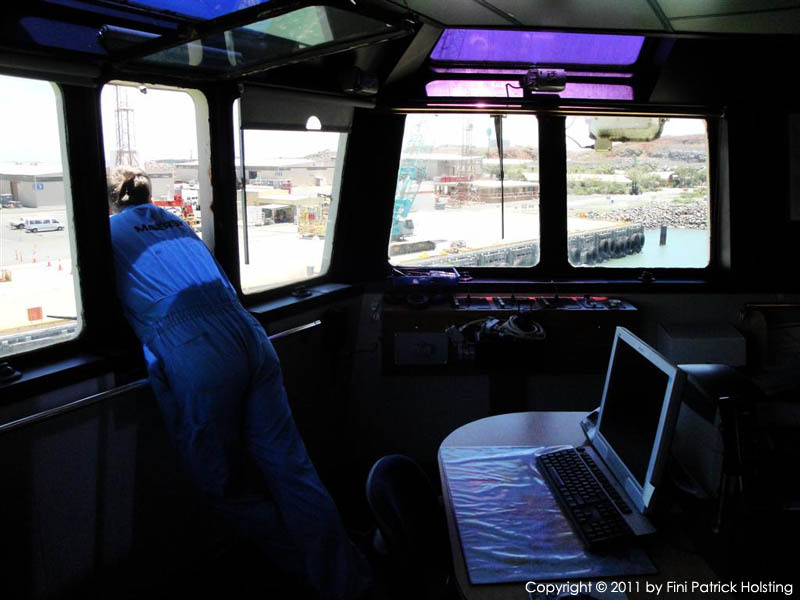 This is the forward deck prepared for port arrival. The Captain keeping an eye on the distance to the wharf from the bridge wing, as the Chief Officer (not in picture) manouvers the Promoter alongside for mooring. 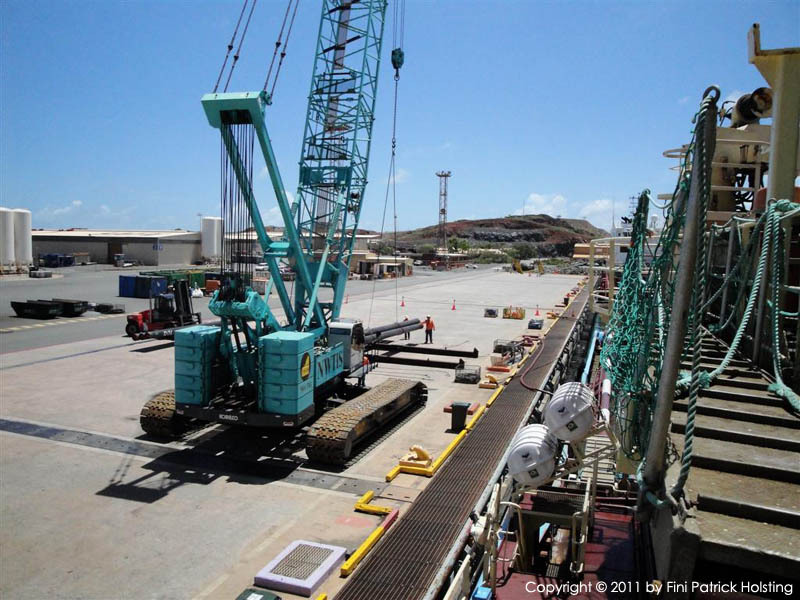 Successfully moored, we commenced loading pipes for the Nan Hai VI semi-sub platform. These were loaded by the port's mobile crane. 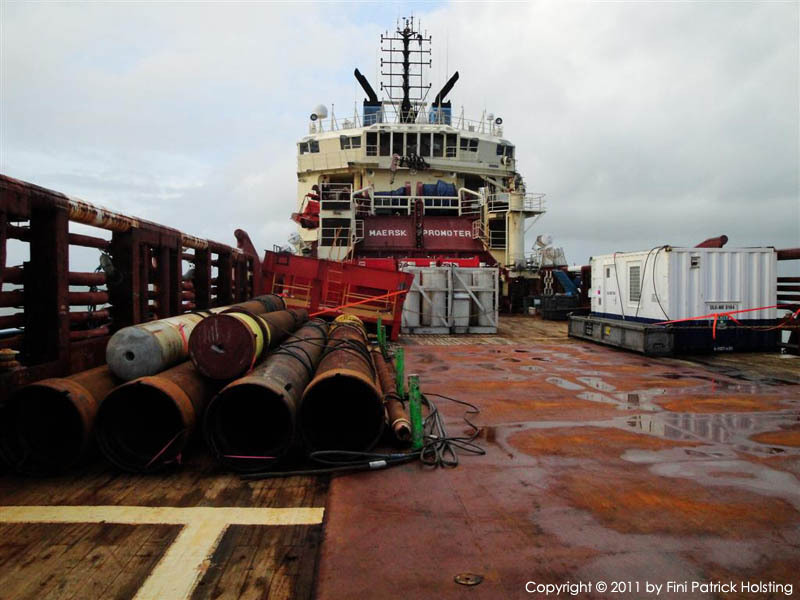 Stacking the pipes on the deck of the Promoter among other cargo such as food containers, drill bits, valve blocks, power packs etc. 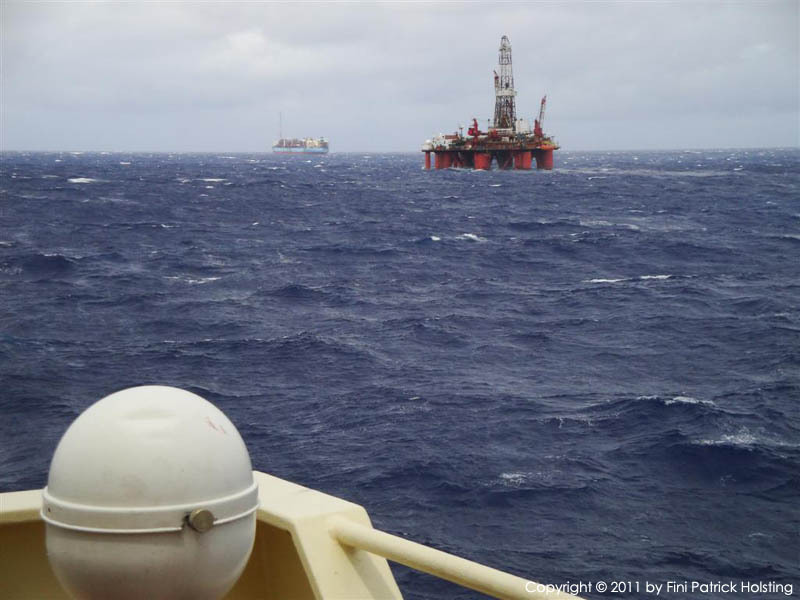 All the equipment was going to the Nan Hai VI drilling rig, in order for them to start drilling offshore wells in preparation for oil- and gas production. 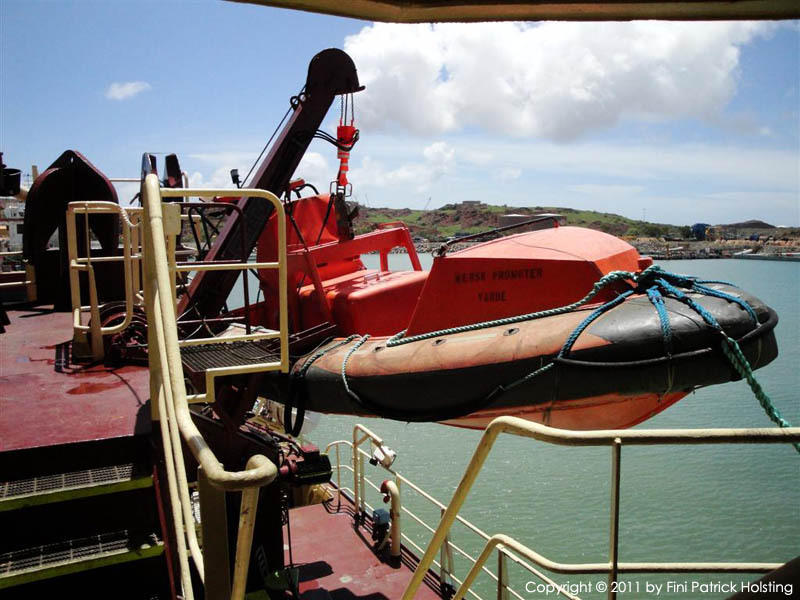 Maersk Promoters Fast Rescue Craft (FRC) stored in the davit. With a 200 horsepower inboard engine, this boat can do nearly 30 knots, and is used for offshore rescue operations. We man the boat ourselves among the Maersk Promoter's crew, and it has a standard crew of three. 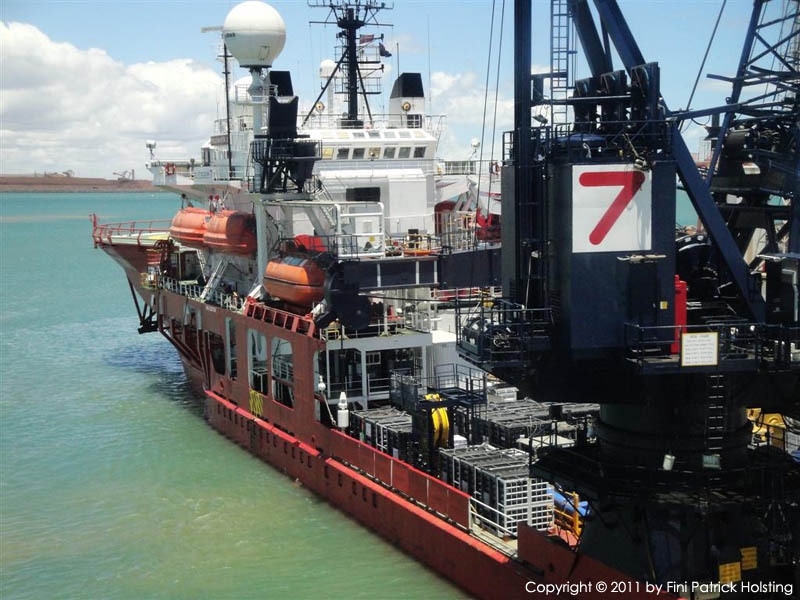 A Subsea 7 Rockwater boat, built for offshore construction, industrial diving operations and other related work. 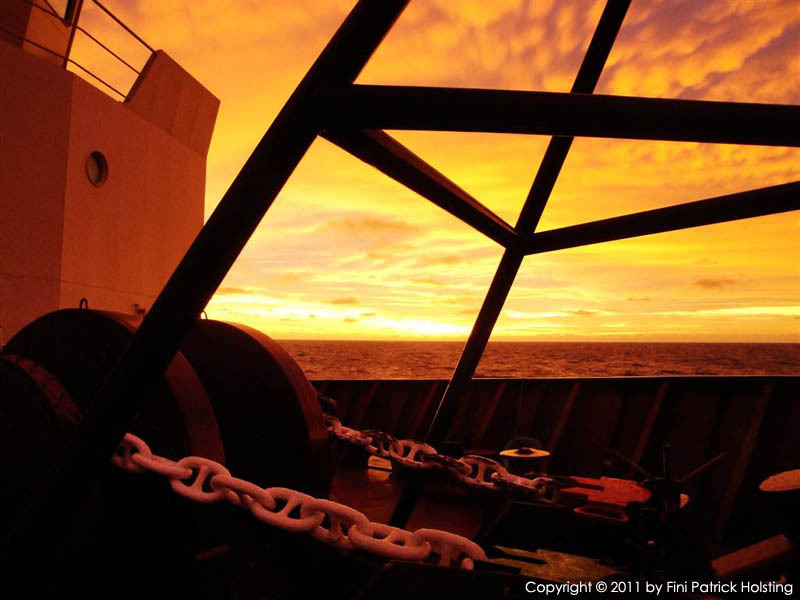 The Maesk Promoter's deck cargo as seen from the aft deck, looking forward. The two winches wrapped in blue tarpaulins, visible above the ship's name above the winch garage, are the spare reels, used for storing towing- and anchor handling wires and related equipment when not in use. 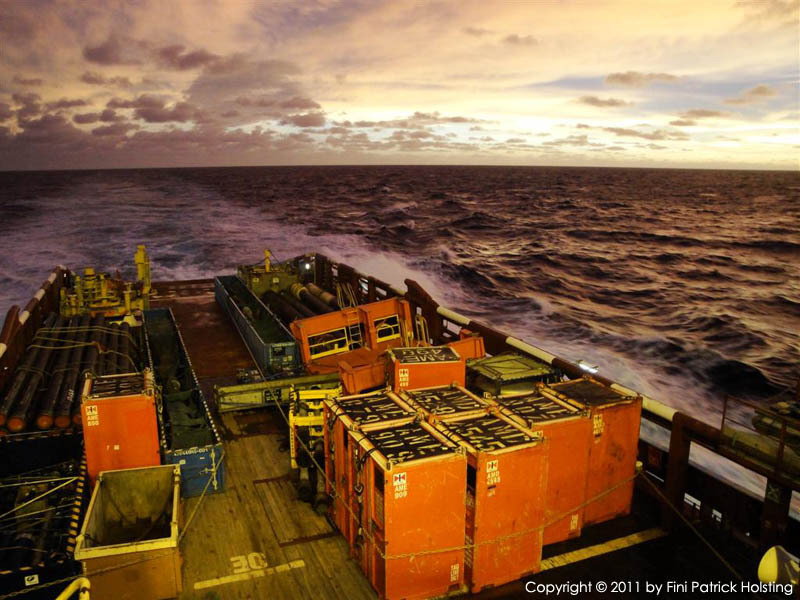 Sun sets over a full load of deck cargo, as the Maersk Promoter works its way towards the oil fields. 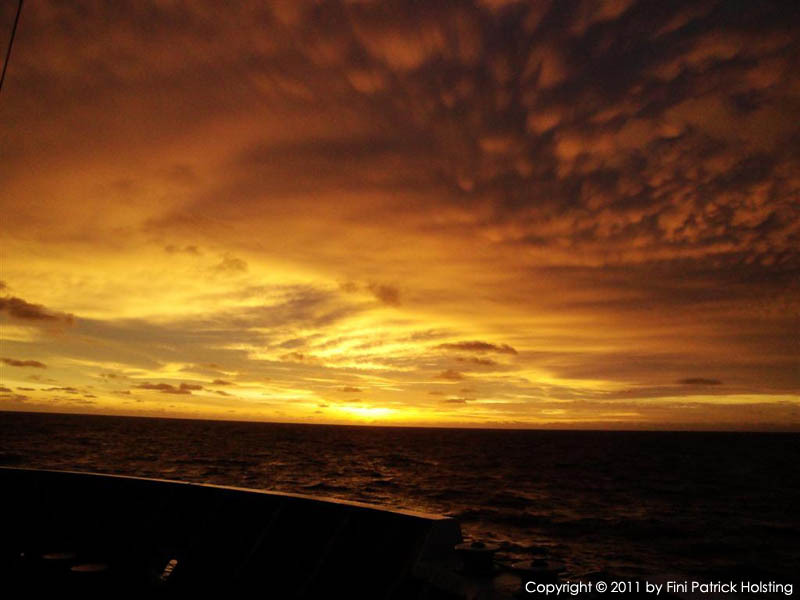 Interesting sky formations start building up as Cyclone Carlos approaches in january 2011. 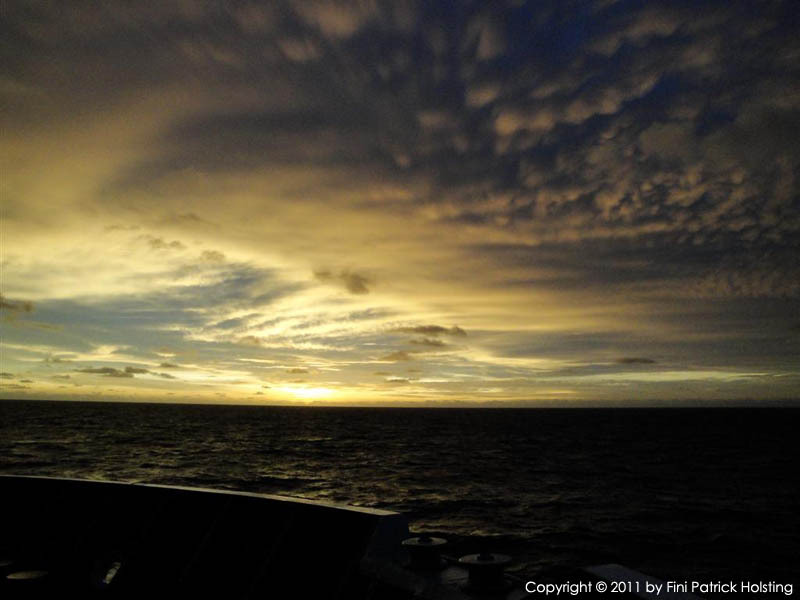 A very special light bathed the foredeck (forecastle) of the ship in this pre-cyclone sunset. These photos are not color manipulated. 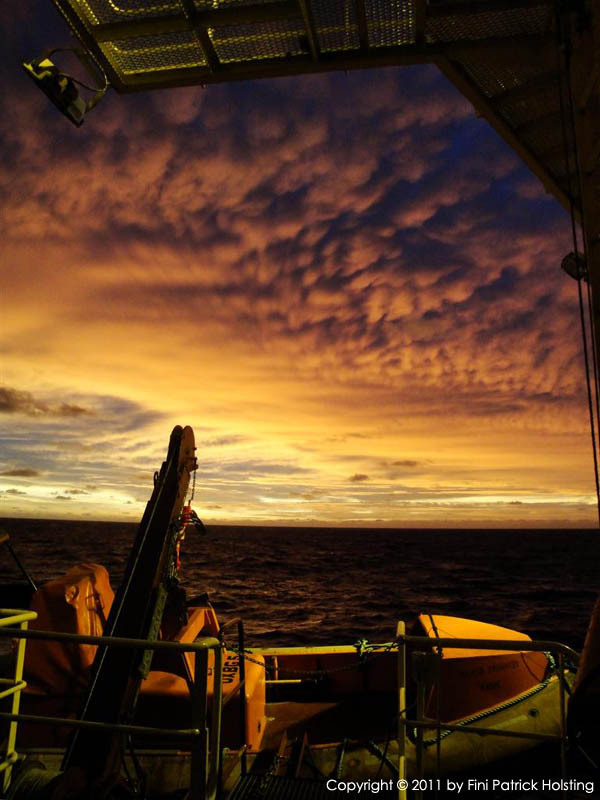 Having a look on the other side of the accommodation above the winch garage, as dramatic skies build up above Maersk Promoter's fast rescue craft (FRC).